Friday's quilts of the week. I have had word that a few new quilters have come on board with lots of enthusiasm and that is always good news. We have been mentioned in an ABC news article and I even did a regional radio interview (thanks for that Naomi) and I have been asked to do another speaking engagement. There have been more donations of fabric and I will be collecting more on Monday. Just a reminder anyone short of fabric - feel free to email me and send me a 3kg prepaid satchel and I will fill it for you particularly if you want fabric for laundry bags or backings. There are two Aussie Hero Sewing Days coming up in the next two weeks, one in Penrith on 8 July and one in Gawler SA on 10 July. Leave a comment or email me for details of either. Yep, it has been a good week. 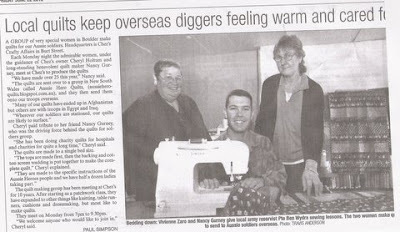 Nancy from WA has been sewing and quilting for various charities for over 20 years and is well known in her area. She seems to have the whole region organized to help out, either with donations or effort. This week she sent off five quilts courtesy of everyone's help! and one for a girl! She even managed to include a little bit of Aussie fabric on the girl's! Liz has been busy again and sent off her gorgeous wonky log cabin which was a collaborative effort made up of blocks donated by the Quilter's Patch group from Kalamunda. Erika sent off these two today as well but this first one now has a Southern Cross on it only Erika forgot to take a pic of it. Nevermind...we can use our imagination! I showed you the link to the news article in which we rated a mention in Wednesday night's post but did you check out the gallery of photos taken by the journalist Kathy McLeish - you really need to check them out! Another Penrith sewing day coming up on 8th of July. We need six ladies to come. We are going to be making the laundry bags and they are super super easy. I will provide all materials and instructions where needed. Please contact me if you can make it. We have had lots of new requests in the last few days and so far all of them are allocated except for the very latest - a female. Anyone out there want to make a girly quilt? Just leave a comment or send me an email and I will send you the details. The deadline is not so tight on this one as our usual requests as I think you could have till the end of July, or maybe even a little longer to get this one in the mail. Talking of mail - here is some happy mail that I received and haven't had time to show you. Maria, one of the original Aussie Hero Friends, (can't say one of the oldest as that just doesn't sound right) made these quilt tops and sent them to me. First up love this red and blue and a smidge of white - so bright and cheery! This one features another fabulous donated tea towel surrounded by snippets of aussie country side fabric. Check out these two disappearing nine patch top - the same fabrics but two different layouts and both quilts look so different. Both are getting different backings too - one has wonderful zebra fabric that I have been saving (has exactly the same green in it!). Haven't decided on the other one yet Maybe a cream coloured scroll fabric. Just as well I don't have to. I am so excited to say that more quilters are hearing about us and joining in - I am sure there are even more out there that I haven't heard about. Just wonderful. Tomorrow night I will be showing all the quilts that have made it into the mail this week. If you have sent one can you please make sure I have a photo of it to include. So far I have Nancy's, Liz's and Christine's. And I got asked to go and speak to the St Matthew's "Coffee &Discovery Senior's Group in Baulkham Hills in November. As I said before, just as well public speaking doesn't scare me - oh thank goodness for my Junior Officer Staff Course in the Navy. That training is going to come in handy - just not how they expected it to. Till next time.........keep spreading the work and happy stitching! I started my morning with a radio interview with a lovely fellow from 5RM in Renmark SA. Naomi had emailed (or Facebook messaged) him yesterday in an effort to get the word out about Aussie Heroes in her area but she wasn't expecting him to get back to her so soon and she wasn't available when he tried to call her this morning! So, he called me. He was a great guy, did his homework before the interview and it made it much easier coz I knew fairly well what area we were covering and so did he so it all went smoothly. Then this afternoon I found out that we rated a very brief mention in an ABC news story available here by Kathy McLeish. They were talking about people who sent things to the groups and they mentioned a group called Hero Quilts and it took a minute to realize they were talking about us - guess we are making an impression by now. Way to go Aussie heroes! Of course we know we are making an impression with the people that matter. Last night's final tally was 11 requests for quilts and I am so proud to say that you all rose to the challenge and as of this afternoon all requests have been allocated to an Aussie Hero Friend. You all just make me so darn proud. Every time I think this is getting too big and maybe I have bitten off more than I can chew, you guys always remind me that I am not in this alone and that you are all behind me!!! Honestly! Aussie Hero Friends are the best! Thank you so very much for the lovely laundry bag you made. Well, I in TK I was sharing a room with 3 other girls. I mentioned to Axxxx (whose bed was beside mine) one morning that my laundry bag had a split down the side of it. I was quite sad because it was the laundry bag I was issued at recruiting. It had both my maiden name, and in recent years, also my married name on it and also held a lot of memories in it for me. I didn't think too much more about it and continued on with my day. That afternoon (Yes, the exact same day! ), the Padre came to visit me and had a box in his arms. After some chit chat, he asked me "Hey XXXXX, do you need a laundry bag?". Now, I can tell you, I gave him a very weird look and said "Yes, but how do you know" and was already starting to wonder which of my roommates had told him. Anyway, he then told me that a lady and sent over some handmade laundry bags, that some of them were made out of 'girlie' material and would I like one! As you can imagine, I jumped at it. I picked the lovely brown one with pictures of patched brown denim and pretty pink flowers all over it. Afghanistan is a very bleak place, so its really nice to have something girlie in a place like that. I have to honestly say that although I have never met you, every time I do my laundry I do think of your kindness. I do believe that what goes around comes around, and you have a lot of good coming your way! And I LOVE LOVE LOVE this one! Footrot Flats! How cool is this! No need for a name patch on this one. This is truly one of a kind!! Big thanks to the lady that gave Maria this material. So much is happening at the moment - heaven only knows what is around the corner. Lots more requests coming in - can you help? Sorry, no photos tonight - important Aussie Hero Stuff to discuss. XXXXX has passed on you name to me with regard to Quilts and laundry bags. I am very much interested in getting a quilt and laundry bag. I had a look on the website and think they are fantastic. I think it would be something special to take with me on future deployments, a little bit of home whilst I am away. Good morning. I really don't like asking for anything, but your kind offer has prompted me to do so on this occasion. It would be a wonderful reminder and memento of my time away from my loved ones, both family and friends. Whilst I am not one of the 'true' heroes serving in Afghanistan I have the privilege of supporting our operations and in my role I have the need to go 'in-country' several times during my deployment. Having already been there and experienced life at Tarin Kot and Kandahar Airfield, I have a lot of respect for those who are spending their entire rotations there, and the work they are doing, let alone those who are working at our patrol bases beyond the main compounds. Your offer of a free quilt and laundry bag is a magnificent gesture, and very much appreciated, and I would really be grateful to receive them. It is nice to know that there are people supporting all of us who are contributing in some way to the peace and freedom of the people of Afghanistan. I know I am extremely proud to be supporting those who are really doing it tough and putting their lives on the line. Hopefully no more lives will be lost whilst we are there. 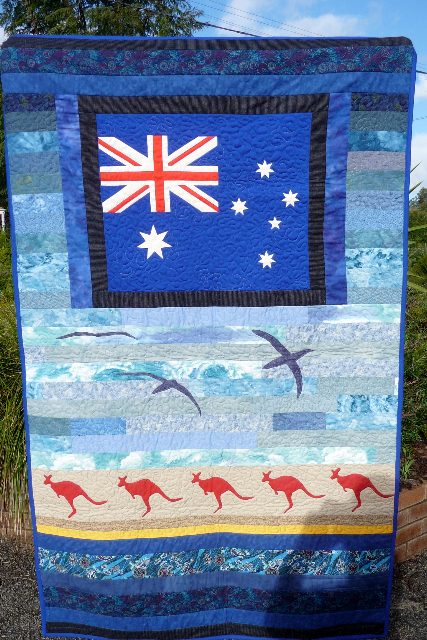 I am currently serving in the Middle east on deployment and would be honoured to receive an Aussie quilt. Thank you so much for your kind thoughts it means a lot to us over here as we miss home terribly and to know we are thought of by many back home keeps us going stronger every day. The word is out that our quilts are now available and so far today I have had 9 requests for quilts today. All but the last 3 have been allocated a quilt or a quilt maker. Of the three that are left two are female so here is your chance to make a girly quilt if you want to. I have a strict no stress rule! Whilst I would love it if someone could put their hand up and say pick me to do one of those quilts, or it three someones could put their hands up, I know that there are lots of quilts underway at the moment and a lot of them are already allocated. Like I said I refuse to stress. If we can't fulfill all the requests immediately so be it. We can only do as much as we can and whatever we do today is way more than was being done in the past before Aussie Heroes was created. I will start a waiting list if need be and see how we go. If the list gets beyond what I think we can manage then I will refuse to accept more requests until numbers ease. I counted up tonight and there are 21 quilts either under construction or promised including the three above. If you are quietly beavering away on a quilt but it is not allocated to anyone you might like to let me know. I have some people on the list that are not coming home for quite a while so there is no mad rush to complete their quilt urgently. You might like to put your name down for one of those. Remember - NO STRESS. We can only do what we can and no more. We all have lives, some of us have families, some have jobs, everyone has issues. Aussie Heroes should be a joy to be part of - not an added pressure. here are the two that I know of and if you have others please let me know. Sunday the 8th of July at Penrith Patchwork starting at 10am we are going to be making laundry bags. We are looking for six more ladies to come along. You need to register with the store or with me as there is only enough room for 8 and that includes myself and Pam who is helping me to set it up. All you need to bring is your sewing machine, thread and scissors etc. I will supply kits for the bags - enough to keep you busy as long as you want. You can BYO lunch or duck across the road to the cafe or bakery. 85223460 or quilt2@bigpond.com if you can make it. I am interested in your Quilts and personalised Laundry bags. We have been notified via one of our members here at AMAB that they are available from you. I have had a look on your website and love the thought of haqving something special from home to commemerate why we are here serving our country. I am half way through my rotation at the moment. Information I am after is the pricing of both the quilt and the laundry bag. This idea amazes me, I am touched by your generosity, kindness and supportiveness to all the troops that are putting their life on the line for our country. Its people like yourself and others that help you in this project, that makes us feel like what we are doing and being away from our family and friends for such a long period of time a worthy cause. I have four children, 3 girls and 1 boy that I have left in the capable hands of my husband, who is also a serving member, due to deploy in April next year. Although our children live the Defence life, it doesn't make it any easier on them or our heart strings when we leave the comfort and love of our home. I would love and greatly appreciate a quilt and laundry bag, to decorate my bed space and to know that there are loving people out there that support what we are achieving. I am pleased to be able to tell you that a quilt was sent off in her direction this morning! and probably 10m of this great green one. Today I received four quilt tops in the mail from Maria and at least one of them will have this as a backing! And it really is green in spite of the photos best efforts to make it look grey! We would love to know what you think of Aussie Heroes. Pageviews by country this week! Labels: Aussie Hero Sewing Days Penrith and Gawler, Kim's donated fabric, Who is reading AHQ? It has been a busy Aussie heroes weekend. Yesterday Pam, Judith and I met at Penrith Patchwork to spend the day sewing. Jeff, the owner, was kind enough to donate a bolt of Aussie fabric a few weeks ago that Pam and I partially used to make two quilt tops. Yesterday we layered them and quilted them. Pam managed to get the binding on the one she was working on but I didn't have the binding for mine with me so I continued work on another quilt I am working on which is a special request. 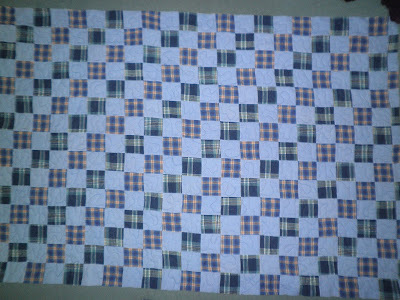 Judith did a great job - she put another quilt together using some of the May BOM blocks. Love the colours in this one. Judith also brought with her two strip quilt tops she had put together at home. Love this Aussie flag fabric. She bought it at Spotlight and it is a twill. I haven't seen it there but I think I need to look for it! It is a twill so would be a great choice for a laundry bag too. I love the cute truck fabric too and it looks great combined with the plaid. Jeff has been tremendously supportive of Aussie heroes and is encouraging us to have monthly sewing days in his store on Sundays. The next one is scheduled for 8 July. We can fit in 6 more stitchers as well as Pam and I so please let me know if you think you can make it. Jeff even donated another two MORE bolts of Aussie fabrics! There were two groups working away at the shop yesterday. The other group was painting on fabric. One of the ladies, with the delightfully Aussie name of Adelaide, was hand painting the most exquisite Aussie motifs on fabric! Take a look for yourself. I was blown away by them and cheekily suggested she might like to do one for an Aussie hero quilt! Guess what! She is going to! Adelaide has promised to do a Warratah for us! I think that will have to go into a special wall hanging - might have to speak to the head chaplain about that one. While three of us were stitching away in Penrith there were 18 ladies stitching away in berri, SA. Berri is a small town about 240 km from Adelaide and according to the 2006 census they have a population of around 4000. Boy did they put sydney to shame, although they did have more notice of the sewing day than we did. Still Helen from the Berri uniting church arranged a sewing day and 18 lovely ladies turned out! Through the church Helen provided all the fabrics and by the end of of the day 18 quilt tops had been made and according to naomi, also from Berri, more have been taken home to be sewn. WOW! Naomi texted me a couple of photos but she has more and is going to send them through to me tomorrow once my (teenager inflicted) Internet data drought is over! 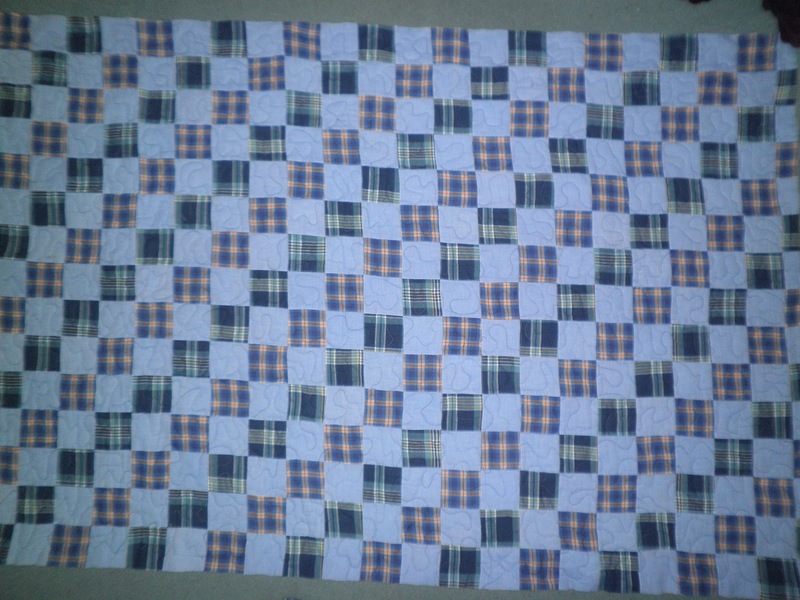 From what I have seen so far there are going to be a good bunch of cozy plaid quilts heading overseas soon. Two of the lovely ladies have long arm quilters and they will be quilting all of e quilts! Talking about super efforts, a lovely lady called Nancy has been beavering away quietly in the goldfields of WA. Last week she wasn't able to keep things as quiet as she would have liked! The local paper came to visit and do an article about her efforts for Aussie Heroes. They even brought in a local Army guy to sit in for the photos! Nancy currently has in excess of 25 quilts quilted and ready to go. Five are heading off later this week. She had promised me photos to show you soon. Nancy has been aided and abetted by Cheryl who runs Chez's Crafty Affair and a number of other local ladies. She has a sewing group that meets on Mondays and other ladies that sew for her make quilts for charities. Nancy seems to have organised the whole town to contribute one way or another. and even ten string blocks like these ones! And just before I go - does anyone know where I can get one of these. The lovely ladies at Penrith Patchwork lent us this one yesterday to help us do up the pins on the quilts we were layering. WOW! Did it work a charm! So much easier on the fingers but the shop doesn't have any more to sell. The fellow who was making them - turning the wood and then attaching the rivet at the end - is not doing them any more. I figure someone must know where you can buy them so I am all ears ladies - please leave me a comment if you know where I can get one! Till next time.....................keep spreading the word and happy stitching! Quilts for this week and Data woes! First up - thanks to my teenagers prowess (?) with their computers we are all out of data or I should say the speed has been slowed WAY down so I currrently have 13 emails trying valiantly to get through to me and they are not having much success. My suggestion would be that unless you have anything urgent to tell me you might like to wait till Monday when my data pops back up again! Seriously, you would think 500GB would be enough! Apparently not! One to a more happy subject, these are the quilts that went on their merry way this week. 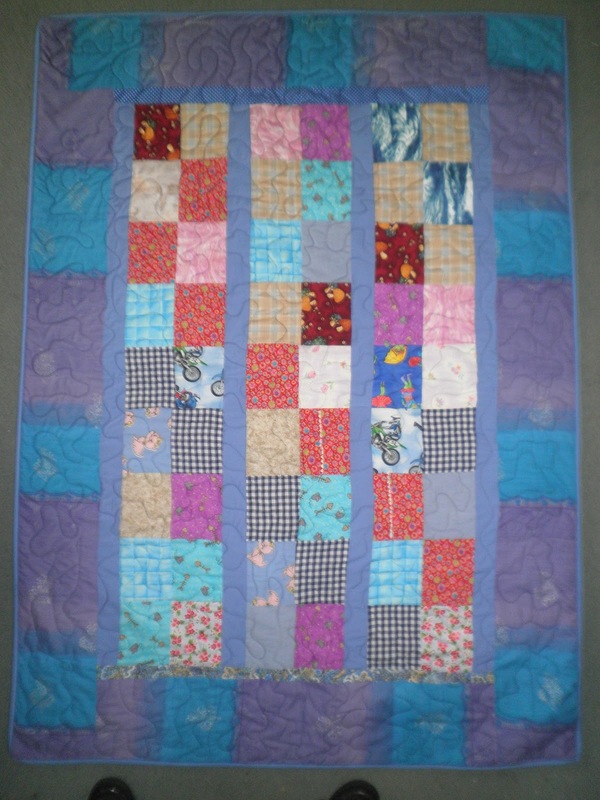 You probably remember Kirsten's super cool first ever quilt! The Tetris quilt went up on facebook as soon as it was finished in a quest to find the perfect owner for it and it was snapped up in minutes! It went off with the cool camo laundry bag (thanks to Sue for donating that fabric!). The camo fabric is also the back for this quilt. Just right I would think. This little lovely, being expertly displayed by Gail, its maker, is on its way to Egypt right now. This was quilted by Donna, who is a professional quilter here in Sydney and she has kindly offered to quilt for us from now on. Thanks so much Donna! Wendy pieced this one and Denise quilted it. I put this one up on facebook too in the hopes of finding a nice home for it seeing as it is a girly one and it was also snapped up very quickly. Someone who works at Edinburgh, the RAAF base in SA saw it and asked if it could be sent to a friend of hers over there. I sent this one off early in the week and it has landed on the Head Chaplain's desk. He has told me he has given it to a chaplain to take to the FOB - which I think means Forward Operating Base - you can take that to mean it will end up in the hands of someone who really deserves it! This is rather fitting seeing as this is one of the May BOM quilts. Can't beat a tradtional quilt for looking cozy and comforting! This one has headed off to Egypt. It was made by me with strips from Gumnuts and Sue P and I really like the colours in this. This one was made by Cynthia and was handed to a young woman as she arrived home. The young lady, that we call "Cupcake Girl" as she has a small cupcake tattoo was serving with Cynthia's son who is due to come home very soon. And finally this one was made especially for an Aussie Hero Friend's son-in-law. My data is too slow to send her an email to see if she is happy for me to identify her but it doesn't really matter. Liz made this one as Mother-in-law had run out of time but MIL had the pleasure of handing it over in person. Well, that is it for this week. Aussie Hero Sewing Day in Penrith tomorrow so I am off to pack up for it and make sure I have everything I need cut out etc. We will be quilting two quilts and the new ladies will be sewing laundry bags and, if we get that far, wonky log cabins. I won't be posting tomorrow night, and possibly not Sunday night thanks to the DATA DROUGHT!!!!! Till next time....................keep spreading the word and happy stitching! This quilt was send off recently. 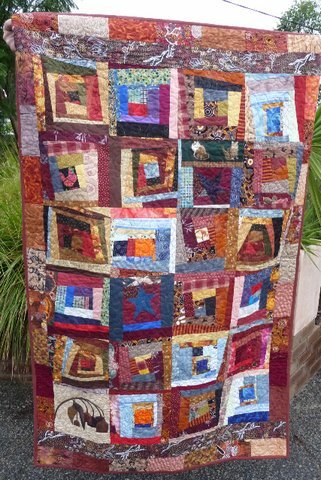 It was made by Elizabeth and quilted by Carol of Turramurra Quilters. It has arrived now and I received a lovely thank you message from the recipient. Thanks so much for the quilt, I received it yesterday. Its lovely, I really like the Aussie green and gold theme and the laundry bag is a really nice patterned material, much more exciting than the calico issued laundry bag. I will happily put up your flyer. All the best and thanks again. I honestly really appreciate the quilt and am so impressed in you ladies for doing this for us. A couple of weeks ago I received these great May BOM blocks from Ilse. I needed a few more and Sharina had emailed me and offered to make more if I needed her to so I took her up on her offer. And Sharina's blocks turned up today and don't they look great! And last but not least check out these gorgeous blocks for our June BOM all the way from Lisa in America. This is going to be a gorgeous quilt! And now I am off to finish sorting quilts for quilters. I have spent most of today piecing backings for all the quilt tops I have so that tomorrow I can deliver quilts to two quilters and mail some other bits off. Who is sewing out there? Belvedere is Back and SO MUCH MORE! LOOOOONG post today - grab a cuppa!